Kenstar 25 L Convection Microwave Oven (KJ25CSL101, Silver) has 10 power levels, 25 liters of capacity, and one year of warranty on product and 3 years of warranty on magnetron. This Kenstar KJ25CSL101 microwave oven has 250 auto cook menus. The list of a comprehensive auto cook menus is great to cook a wide variety of foods automatically. Further, it has Sensi Grill feature for automatic reminder on cooking completion. This feature is very useful for recipes such as aaloo tikki, cutlet and other likewise cooking items. 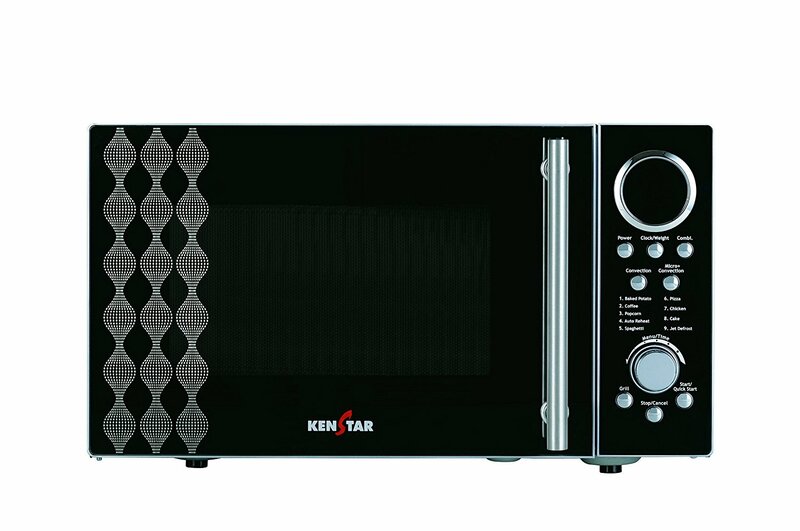 Also, Kenstar KJ25CSL101 microwave has Combi Function, which is good for different combinations of micro, convection and grill functions. And using the Auto Defrost feature utilizing the frozen hard foods is really very easy and delicious. This Kenstar high power microwave oven has Express Cooking feature that is good to automatically choose the required settings based on auto cook menu. Further, it has Cycle-End Buzzer feature that beeps for a minute at the end of cooking cycle just to notify that your food is prepared to be served. Other highlights are a multi-cook tawa, digital jog wheel, child safety lock, start-up kit and multi-stage cooking.